Tears threaten to break through. Through the wall I’ve spent a lifetime building. Building to protect my heart. I’m overwhelemed. Yet I don’t ask for help. I’m tired. Yet I spend hours awake worried. I’m sad. Yet I put on a happy face. It’s time to lay it down. And not pick it up again. Bottom line, the weight of the world (or just of my family) became a burden I didn’t hand over to God. Overwhelming. The summer did not provide much of a break or rest for me. When I did have down time, I allowed my fear to keep me from true rest. I did not trust. 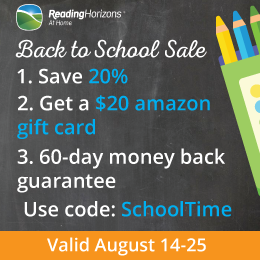 My wake up call came during our homeschool convention as I prepared for a new school year. Keyword: NEW. I need new. I need to put old things away and leave my worries in the hands of Christ. 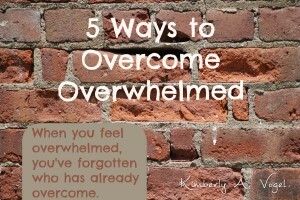 When you feel overwhelmed, you’ve forgotten who has already overcome. Give Thanks. Even if you don’t feel like it. Especially if you don’t feel like it. Gratitude helps us get the focus off ourselves. Call on the Lord. Pray. Continually. Follow Him to safety and rest. When the weight of the World overwhelms, his yoke is light. Remember WHO is the one who overcomes! When we try to overcome on our own, we become overwhelmed. Great article and very good timing! With all that is going on around us and in our world, it is easy to feel overwhelmed. Keep up the great work with your blog! Thanks! I enjoyed your prayer calendar! Great work! Beautifully said, Kimberly. You are an overcomer!